It’s morning in Musrara and I am eating my breakfast of eggs, pita, hummus, and tomatoes outside at a glass table on a large marble balcony. Doves trill above me as a mother coos sweetly to her baby girl somewhere on the street below. The sky is clear, the sun is hot, and the breeze is cool, which I happily welcome each time it decides to dip down and brush my shoulders or twirl my hair. The house where I am staying belongs to my dear friends from Atlanta, the Gray's, or Graytones, as they endearingly refer to themselves. They arrived in July with their two children for a four-year stint as the communications coordinators for the Lutheran church. Their East Jerusalem neighborhood of Musrara was once an affluent Palestinian area, but now houses a mix of everyone: mostly Jews (North African and Orthodox) nearest to their home, as well as Palestinians (Christian and Muslim), and a handful of Ex-Pats. Despite the mixing, the neighborhood continues to mark the threshold between Arab and Jewish Jerusalem. It also happens to be the location where the Israeli Black Panther party founded by Moroccan Jews arose. As I gaze around and get acquainted with the area I am tickled to spot hints of home in the U.S. around me--little emblems the Grays' have brought from one home to make another home here. It is the bright orange traffic cone that first catches my eye, sitting unassumingly in one corner of the patio behind the laundry rack. "Road Rage Champion" is spray painted through a stencil across it. Ben, the husband, is not only a fantastic photographer, but avid runner--avid and bold, as the Road Rage run is the marathon taking place side by side with traffic the night before Atlanta's infamous July 4th Peachtree Road Race. He was not the champion, only gifted the cone by the winner just before he moved here, but he might has well have been the champion. This year he ran the Road Rage, then in the first wave of the Peachtree some 12 hour later the next morning, and lastly photographed the rest of the race for the Atlanta Journal Constitution. 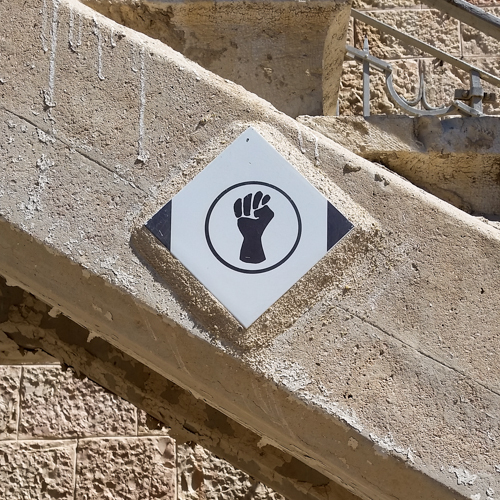 Here in Jerusalem he runs with the group Right to Movement, an international runners group promoting the right to freedom of movement as established in Article 13 of the Human Rights Charter. I keep scanning my surroundings. The streets are tight here so the houses are close, creating a sort of community of balconies in the middle. I can imagine neighbors talking to each other across their balconies as I saw two Italian women do from their fourth story catty-corner windows on opposite sides of a street in Cortona. The walls around me are made of large, rough sandstone-colored brick and the windows are tall and arched at the top with grated decorative iron bars over them. Most people have plants, multi-colored bougainvillea and succulents are a few I recognize. The flat roofs have white tanks on top which connect to solar panels to provide hot water to the homes below. I turn my attention back to the Grays' house and chuckle as I notice another souvenir from the States, a small, but clear yellow sign over the door leading back inside stating, "BOUNDARY WILDLIFE MANAGEMENT AREA: Georgia Department of Natural Resources, Wildlife Producers Division, US Forest Service Cooperations." I am curious about the story behind that one. Suddenly a small parade of young guys emerge from a side street below, chatting and piping on a shofar, the ancient Jewish musical instrument made from a ram's horn used for religious purposes, or just for kicks, apparently. I take it as my cue to commence on the day.